The $101.5 million Bob Bolen Public Safety Training Complex houses training and administrative operations for both the police and fire departments. The complex includes a village of buildings meant to simulate what officers and firefighters will experience on the streets of Fort Worth, Texas. The facility includes an outdoor 5,300 sq. 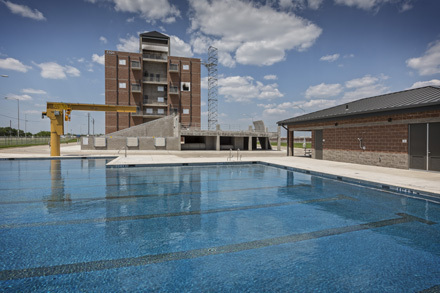 ft. pool featuring seven 25-yard lap lanes, LED underwater lights, an underwater bench, and a deep-water training area. 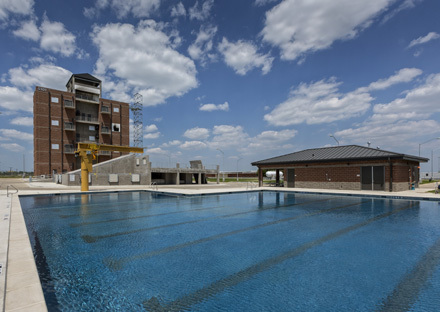 A five ton freestanding jib crane is located at the deep training area of the pool, allowing vehicles or other items to be plaed in the pool to simulate an extraction rescue training scenario. For the Police Department, the new center adds classroom space, greater technology and the ability to sell training to outside police agencies. It also includes a 25-acre Emergency Vehicle Operations Course driving track. The indoor gun ranges reduce noise for neighbors and allow more flexibility and access to recruits and officers. The indoor police “Tactical Village” has movable walls, allowing changes in the configuration for the facility for the driving simulations. For the Fire Department, the center has facilities for training in confined spaces, high-rise and high-angle emergencies, hazardous materials and other “heavy rescue” situations.